Introducing the OBM W series by Postium. It incorporates 12G-SDI input and loopout(x2), HDMI 2.0 input, SFP optical connector, Component and Composite on the panel of full HD resolution, offering advanced and convenient features such as HDR(High Dynamic Range), Ethernet Control, Camera Log display, etc. 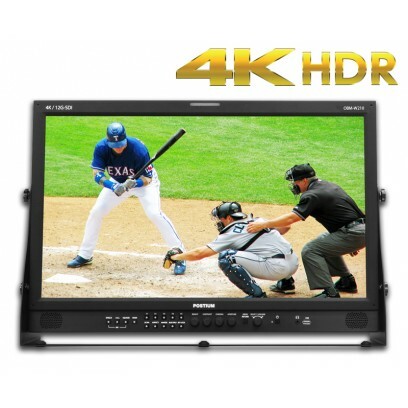 The OBM series provides the function to display the High Dynamic Range footage. Postium HDR function allows users to view both highlights and shadow detail of scenes at the same time, thus resulting in more natural and realistic images. The OBM series supports PQ EOTF (SMPTE ST 2084), Hybrid Log Gamma and S-Log3. This function controls the aperture level of a video signal, and displays images on screen with sharpened edges to help camera focus operation. This function minimise the interlaced video processing time delay. This mode is also useful when displaying fast-motion interlaced video content and when reducing the delay between video and audio. This function evaluates the Luma(Y') level of the input image. If the certain Y' level is set, the pixels with the designated Luma(Y') level are displayed with the zebra pattern or the colour pattern. There are three modes in OBM False Colour. Gamma value is adjustable from 1.0 to 3.0 as user’s preference to monitor in the dark area of the picture. Any pictures taken in either light or dark environment can be easily watched or analyzed. The OBM series can be connected via Ethernet connection and controlled remotely on the network. This function allows users to save the monitor configuration and adjustment settings on the USB memory stick and load them to other monitors. This is useful for multiple monitor systems, allowing the transfer of one monitor’s setup and adjustment data to another. The OBM series can display various markers, including aspect marker, area marker, and center marker. In addition, the detailed display settings of each marker are allowed. For example, the colour, brightness, horizontal/vertical position, and thickness of aspect markers can all be adjusted. The image source names and tally information can be displayed on the screen, with an external remote function via Ethernet. The TSL system protocol is supported. The colour of the source name and tally colour can be selectable among White, Red, Green, Blue, Yellow, Cyan, Magenta.